After a successful spring 2008 campaign, the men’s and women’s tennis teams headed to the road for preseason tournaments and continued right where they left off. Sophomore Jenna Osborne and No. 12 Miami competed without No. 14 Laura Vallverdu against 11 other teams, four of which are in the top 35, at the 16th annual William & Mary Invitational in Williamsburg, Va.
Osborne, the only Cane left in the main draw, defeated Maria Morrissey of W&M 6-2, 6-3 in the singles flight E final, while No. 109 Bianca Eichkorn and junior Claudia Wasilewski each won in consolation finals. In doubles play, freshman Gabriela Mejia and Osborne beat Ohio State’s Angela DiPastina and Christina Keesey 8-5 in the consolation final. The tandem of sophomore Michaela Kissell and freshman Lauren Greco, playing together for the first time, fell 8-3 to W&M’s Ragini Acharya and Katarina Zoricic for third place. The women’s team returns to action next weekend at the Riviera/ITA All-American Championships in Pacific Palisades, Calif.
On the men’s side, sophomore Keith Crowley finished third overall to lead the No. 19 Hurricanes at the Wolverine Invitational in Ann Arbor, Mich.
Crowley, who improved to 2-1 with a straight sets victory over Denver’s Martin Zimmerman 6-3, 7-5 in the third position, earned 20 total points. Senior Daniel Rosenfeld tied for seventh with wins in singles and doubles play Sunday, while junior transfer David Simon tied for ninth. Freshman Ignacio Taboada also moved to 2-1 with a three-set win against Pioneer Yannick Weihs. 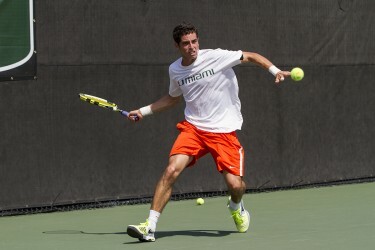 Miami played without third-ranked Daniel Vallverdu as well as the top-ranked doubles team of him and sophomore Carl Sundberg. 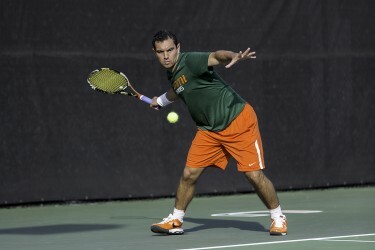 All four teams that competed – Miami, Michigan, Denver and Notre Dame – rank in the top 50, and points were determined by victories in singles and doubles play and position. Sophomore Jason Jung of Michigan won the individual title with a perfect 3-0 record in singles competition. The Hurricanes return to the court to Oct. 3 when they take part in the All-American Championships in Tulsa, Okla.